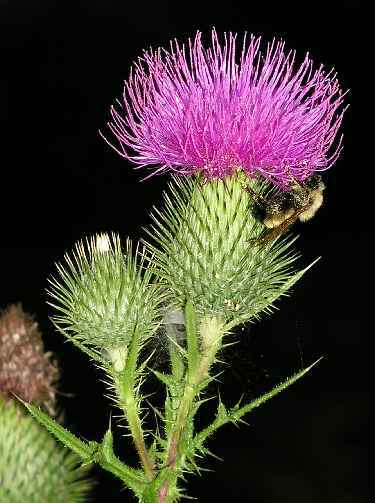 Bull thistle is a herbaceous biennial. Flowering plants can range from 1-7' tall. Stems are spiny winged. Leaves: First year basal rosette leaves can be 20" long. Stem leaves are alternate and coarsely lobed. Lobe tips have stout spines. Leaves are spiny on top and have white woolly hair below. Bull thistle will invade prairies, fields, pastures, roadsides, and ditches.